In drunk driving defense many of our clients not only have an attraction to alcoholic beverages. They also have an aversion to bureaucratic procedures. This combination often proves deadly in terms of the client's driver's license. It is not at all unusual to be retained by a client on a charge of driving while revoked for a revocation that occurred many years ago. Although Transportation Article, § 16-208(b)(2) provides that an individual may apply for reinstatement the day after the revocation is imposed and that the individual may obtain a reinstatement 6 months after the revocation date, the same love of alcohol and avoidance of bureaucracy that got our clients into this mess in the first place has made many of our clients constitutionally incapable of obtaining the required reinstatement. Sometimes it is because they keep paying tickets they receive for minor violations which tell the Motor Vehicle Administration (MVA) they are still driving when they should not be. These people need serious legal help. In State v. McCallum, 321 Md. 451, 583 A.2d 250 (1991), the Court of Appeals recognized that mens rea is an element of the offense of driving while suspended, and by clear implication, driving while revoked. 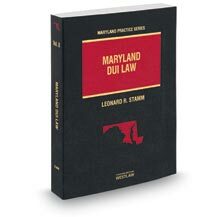 Although Maryland appellate courts have not reached the issue, there is some authority in other jurisdictions for the proposition that a separate and distinct element of the offense of driving while revoked is a valid revocation. E.g., Loe v. State, 654 N.E.2d 1157 (Ind. App. 1995); State v. Atkinson, 751 P.2d 784 (Or. 1988). In Maryland, where the suspension or revocation is as a result of the accumulation of points the MVA must personally serve the licensee or notify the licensee by certified mail, return receipt requested. Transp. Art., § 16-404(b)(2). Transp. Art., § 12-114(c) also provides that proof of even regular mail notice may be made "by the certificate of any officer or employee of the Administration or the affidavit of any adult, naming the person to whom the notice was given and stating the time, place, and manner of giving the notice." It is unusual for the State to have such a certificate in a driving while suspended or revoked case if such certificates actually exist. A review of the licensee's complete driving record will often indicate that both certified and regular mail notices of the proposed point revocation and/or suspension were mailed to the licensee and returned to the MVA by the Postal Authority. Despite the failure of the MVA to notify the licensee or to be able to prove notice, not to mention failure to properly serve process on the licensee, the MVA frequently goes ahead and issues the most severe sanction, as if the licensee had failed to request a hearing after notice. See, Transp. Art., § 16-404(b)(3). A revocation or suspension so imposed is invalid and should not be the basis for a conviction for driving while suspended or revoked. It is possible to secure insurance that this defense will be accepted by the court and at the same time do some good for your client. Since it is apparent from the driving record that the licensee was never given notice or an opportunity to request a hearing, the licensee is still eligible for a hearing. A hearing request, filed by the lawyer, along with an affidavit, signed by the client, indicating that the client never received notice of the original proposed points suspension or revocation, and also accompanied by a copy of the driving record should be sent to the MVA. If the MVA denies the hearing request, there is a record for appeal. On appeal, the Attorney General may be likely to agree to remand the case to the Office of Administrative Hearings for a hearing. In this case, the appeal involves a minimal amount of work. If the MVA grants the hearing request, the hearing should be held, if at all possible, before the date the driving while revoked charge is scheduled to be heard in court. At the hearing, evidence should be presented as to the basis for the original imposition of points, if it is not obvious from the record, the sentence received for the driving offenses which caused the accumulation of points, the licensee's ability to drive a car safely at the present time, as well evidence concerning the licensee's need for the license for employment or personal reasons. Any other mitigating evidence should be presented as well. The requested disposition should the appropriate sanction that would have been originally imposed (normally the sanction for a first hearing for 12 points is something less than revocation), less any consideration for the passage of time and the fact that the licensee has already served a sanction for which he had no notice. The sanction could be the rescission of the original revocation and its replacement with a less harsh sanction, perhaps a retroactive sanction, such as a short suspension. When certified evidence of the rescission of the pre-existing revocation is presented to the State and the court, it should apparent that your client really is not guilty.